Are you knee-deep in the busy holiday season yet? The holidays are pure insanity around here, not just in my personal life, but here on the Divas Can Cook as well. My inbox gets swamped with questions, comments and invitations. It’s really exciting and exhausting, but yet every holiday I always seem to get through it just fine. How you ask? Two words, my husband! Seriously guys, I honestly don’t know where I’d be without that amazing man! When the kitchen is a wreck after a full day of filming cooking videos, he swoops right in and cleans everything up. When I’m stressing over holiday post deadlines he takes the boys on fun adventures to get them out of the house so that I can have peace and quiet to work. Oh and I can’t even count the multiple times he’s done emergency grocery store runs to pick up items I always seem to forget! He truly is my saving grace around this time of year and that is why my I’m recognizing him as my “unsung holiday hero”! I’ve teamed up with Coca-Cola’s #ShareaCoke to shine the spotlight on the amazing people in our lives that go the extra mile to make the holidays extra special. Whether it’s the friendly cashier that always greets you with a warm smile, the dedicated teacher that helps your child make holiday gifts or even your neighbor who passes out homemade holiday cookies, these unsung heroes often go unnoticed. Yet, they go above and beyond to make sure the people around them are happy. This busy holiday season is the perfect time to show them just how much we appreciate them. Nothing says thoughtfulness like a customized gift! 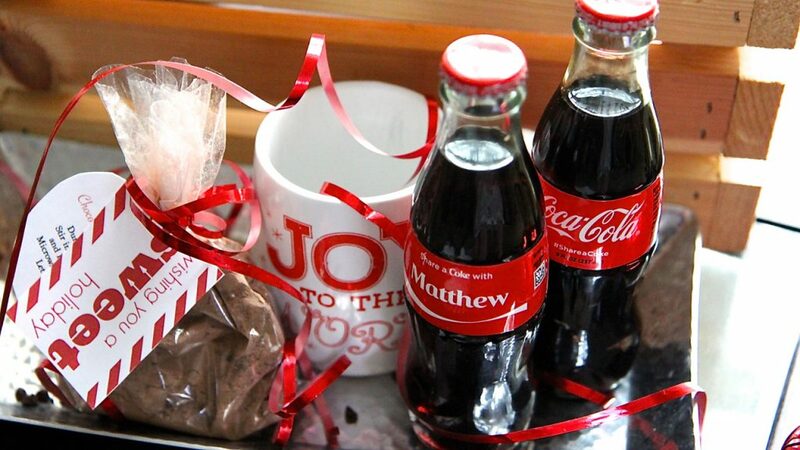 Coco-Cola’s #ShareaCoke allows you to create personalized coke bottles with a name or phrase. They are great as affordable stand-alone gifts and stocking stuffers or paired in a gift basket. To show my husband just how much I appreciate him I created this quick and easy chocolate Cocoa-Cola mug cake gift. 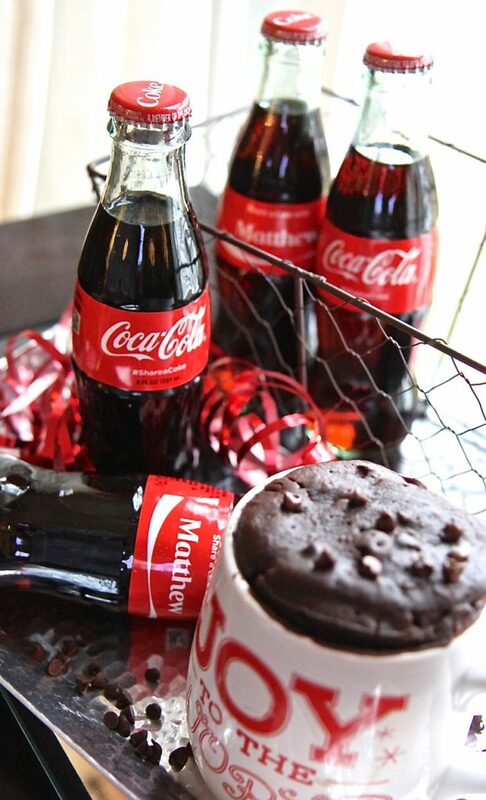 He isn’t much of a cook and he loves chocolate cake and Coca-Cola so this was the perfect gift for him. I placed it on the driver’s seat in his truck right before he was about to run one of my many last minute grocery store errands. He really loved the gift! 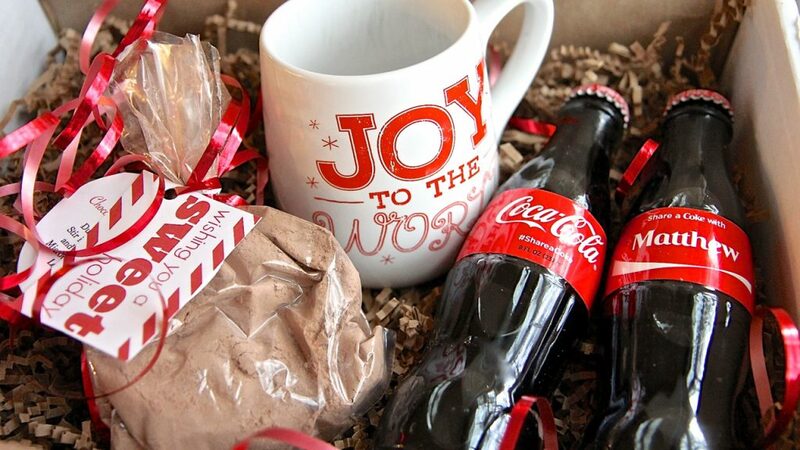 You can easily create one of these chocolate Cocoa- Cola mug cake gift sets for your special unsung hero(s). Simply visit shareacoke.com to create your personalized glass coke bottle. Next go to the store and pick out a large holiday microwave-safe mug. There are great deals on holiday mugs this time of year. I got mine for only $2. The mug cake mix recipe below creates one mug cake. Just affix a label with the instructions and package the mix in a clear treat bag with a festive ribbon. If you want to add more to the gift set, throw in a spoon and several more bags of cake mix. 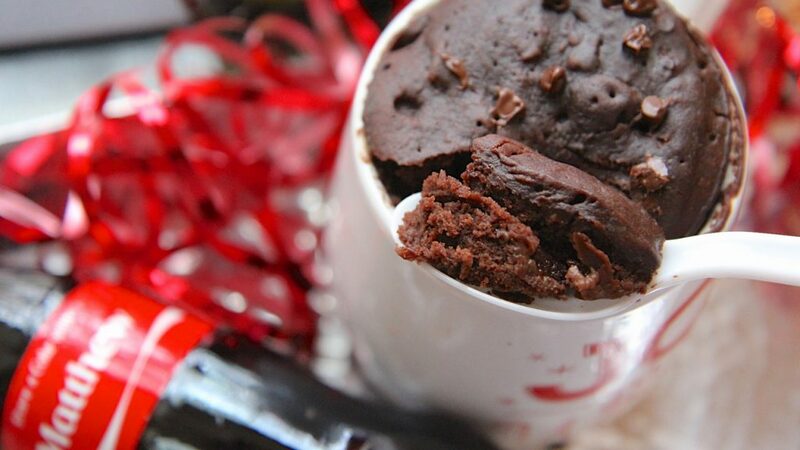 This Chocolate Coca-Cola mug cake is simply delicious, just add Coca-Cola & vegetable oil. Package dry cake mix in a clear treat bag. When ready to prepare, empty dry cake mix into a large microwave-safe bowl. Stir in Coca-Cola and vegetable oil until smooth. Remove from microwave and let cake cool. Easy right? Now you can create one for less by using this discount code: Holiday40 to purchase your personalized Share a Coke glass bottles!! Who is the unsung hero in your life that adds that special touch to your holidays? Leave a comment below to be entered to win a Coca-Cola #ShareaCoke Prize Pack! Prize pack consists of $100 visa gift card + One (1) six-pack of personalized Share A Coke glass bottles!! One entry per person. Winner will be selected randomly on Dec. 14. The Coco-Cola Company will provide this prize. The Coca-Cola Company is not a sponsor, administrator, or responsible in any way for this promotion. Thank you ALL for submitting your entries. I sat here, along with my holiday hero and read each one. WOW! I wasn’t expecting to be so touched by all of the beautiful people in your lives. Thank you so much for taking the time to share!! I would nominate my sister . She helps the needy unselfishly. She’ clips coupons and the products (mostly household) that she saves money on she shares with members of her church, usually single moms or dads and the elderly. In my office we adopt a family for the holidays and when I noticed that everyone was purchasing clothing and toys I called her and asked her if she was willing to donate some of her products. Without hesitation she said to me I will put some things together for the family come by and pick it up. I’m so proud and blessed to have her as my sister. She honors God daily by helping others. Hi, l just wanted to comment on you cooking the sweet potato fries. Your recipes are so great, it’s hard to imagine that you are having challenges. I cut my sweet potatoes kinda thick and coat with olive oil in a heated skillet on top of the stove for a few minutes and then I put the skillet in the oven to finish. They came out crunchy, chewy, and delicious. I know you didn’t ask, so forgive me for putting my 2cent in. Thank you so much for your wonderful, delicious recipes! My parents! They’ve made Christmas special no matter how little they had themselves. It was always about making everyone happy around them. They are two of the most selfless people I know. I’m blessed to still have them both here and blessed that my kids get to experience their greatness now. My cousin Cissi is my unsung hero. My brother passed away in 2013 a few days after I had surgery. Cissi came over from a small town 30 miles away and helped clean my house and sort through a lifetime of “stuff” to pack up, throw away and donate. She offered her home to me for what was going to be 2 months while contractors updated my house so I could sell it. It turned out to be 15 months. Can you imagine a houseguest for 15 months? She cooked, cleaned, and was a safe haven for me (along with her husband and two dogs) while I healed and planned for my next steps in life. Today, I live around the corner from her. She has been there for me through the most horrendous of circumstances. We have had many conversations, but my favorites are when we go to lunch. I always wanted to get to know her better, and I got my wish! She volunteers for the local soup kitchen, has hosted several foreign exchange students and her goodness is never-ceasing. She just loves people and it shows! Myself. Not tooting my own horn but I strive to make myself happy every day. I thank God for waking me up daily to see another day, to spend it with family and friends. I am the thread that holds it all together and believe family should come first after God. I love myself and the fore I am able to love my husband, daughters, grandson and 2 dogs.